Mill-Max is pleased to announce the addition of new crimp receptacles to our selection of wire termination products. The new 07XX series are commercial-off-the-shelf (COTS) alternatives to the popular Mil-Spec M39029 female crimp terminals. The receptacles are fitted with the high reliability Mill-Max spring finger contacts in place of the slit and hooded terminals which characterize the M39029 products. If your application does not demand Mil-Qualified components but requires a similar form factor and high reliability, then these receptacles will fit the bill perfectly. There are five new receptacles to choose from; all are two piece construction consisting of a precision-machined outer shell and stamped beryllium copper internal contact. Each has an inspection hole for viewing the wire during the crimping process and for promoting plating coverage inside the crimp hole. Table 1 below provides details of the pin size, wire accommodation size and Mill-Max part numbers. The Mill-Max part numbers in the table below specify 10 µ" gold plating on the shell and 30 µ" gold plating on the internal contacts. Thicker gold plating options are available upon request. All plating options have a nickel under-plate. 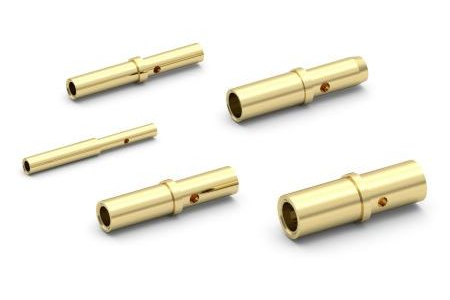 The 07XX series mates with our M39029 COTS equivalent crimp pins (39XX series) as well as Mil-Spec M39029 pins (sizes 12, 14, 16, 20 & 22); when used together they provide an interconnect solution with wire crimp termination for discrete wires or cables. This new family of receptacles provides crimp termination of wire sizes from 28 – 12 AWG. These crimp receptacles are convenient and simple to work with. Since they conform to the dimensions of the Mil-Spec parts, the same crimp tooling can be used to terminate the wires. The attached data sheets provide the Daniels Manufacturing crimp tooling information for these receptacles.